After the hit comedy series “Endukila”, YuppTV is back with yet another light hearted web series “Hey Krishna” starring Varun Sandesh and Kashish Vohra. The webseries is directed by Lakshmi Kanth Chenna and is written by Mahi Illendra. Hey Krishna also has some added attractions in the form of Harsha Chemudu, Adrika Sharma, Mounima CH, and Krishna Chaitanya. 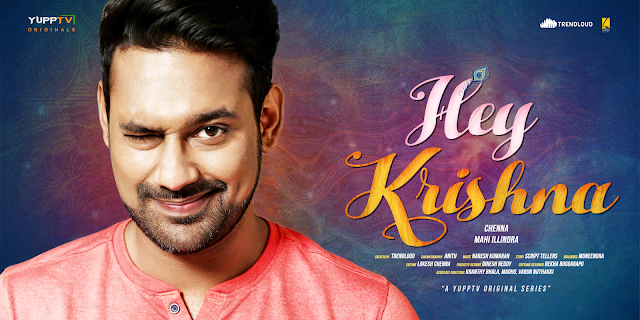 The first look of “Hey Krishna” is gleering in dreamy blue, has Varun Sandesh on the side of it, with a mischievous smile, certainly lets us keep guessing about the storyline and his character in the webseries. With the success of Endukila, YuppTV Originals is certainly ready to make its mark on the digital market, creating an audience for itself on the web media. With Laksmikanth Chenna the telugu film director who has directed movies like Hyderabad Nawabs and Ninna Nedu Repu directing the series, and Mahi Illendra known for movies like Venkatadri Express, Express Raja etc., being the writer, the movie has magicians like Meneendra kumar for dialogues, Anith Kumar Maladi as DOP, Naresh Kumaran for Music, Lokesh Chenna for Editing, and Rekha Boggarapu for Styling, at work. Considering the wonderful acting skills of Happy days fame Varun Sandesh, and the beautiful Kashish Vohra, the YuppTV originals is definitely expected to strengthen its mark laid by Endukila in the territory of Telugu Web Originals.